The Delano Garden is one of over a dozen community gardens in town. For more information on the Community Gardens visit Sedgwick County's site. Established in 2007, the Delano Senior Center Garden provides space for urban gardeners who have no suitable space to garden. The garden is an "Allotment Garden" in which lots are assigned and each gardener pays a fee for the water. In 2016 we found out it would be the final season for the Delano Community Garden due to expansion plans by the Senior Center. This was quite a blow since we had just gotten our new water supply installed the year before. Since then it looks like we might be able to save some portion of the garden, but it will be much smaller. This has caused us to rethink our mission and change our focus. We are working with other organizations through Delano United on their Local Food initiatives. For those who are not aware, Delano is considered a food desert where there is a lack of availability of fresh food. We have observed that the farther a gardener lives from the garden, the less time they will spend there. To address this, we will be encouraging small gardens on every block in Delano. 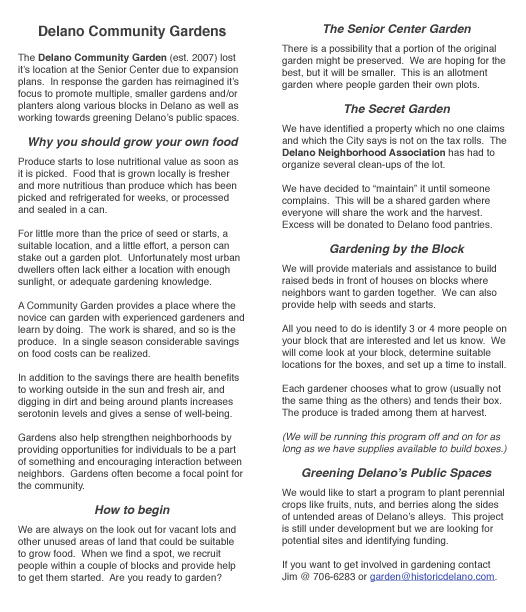 If you know of a spot near your house and are interested in starting a community garden on your block you may contact garden@historicdelano.com for more information.